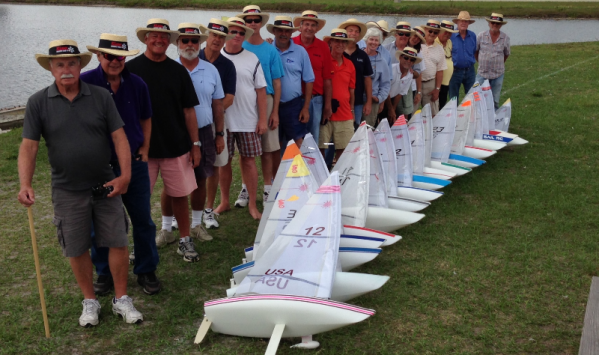 Jack Ward of the host Punta Gorda Fleet handled 21 competitors to win the second annual Snowbird Tuneup Regatta on Thursday, February 27th. RD, Dave Brawner and the team of Art Hawes, Paul Newfield and Fred in the Boat, ran a terrific show with 16 heats in the odds and evens format. In second was Frank Vella, of Naples, who bought his used Laser two days before the regatta. He even made a lifting stick the night before the regatta. Frank is the Soling Class Secretary and a top sailor in the Soling and EC12 classes. We welcome him to the RC Laser Class. Scott Loesel came over from East Florida for the day to grab third with Nick Mortgu and Dave Branning in 4th and 5th respectively. Weather for the early part of the day was looking ominous as the clouds threatened but never delivered the rain. Thanks to Nick Mortgu who organized the regatta for the 2nd year in a row. We all sported our skipper gift sun hats for the final picture above. 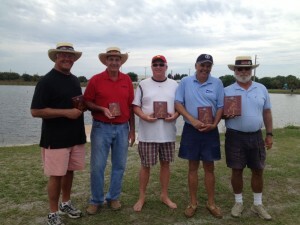 This was the second leg of the Snowbird Series, which started last Sunday in Coconut Creek, FL. The next report will be the third leg, the 11th Annual Marco Island Midwinter Championship. Here’s the Snowbird Tuneup Results below.